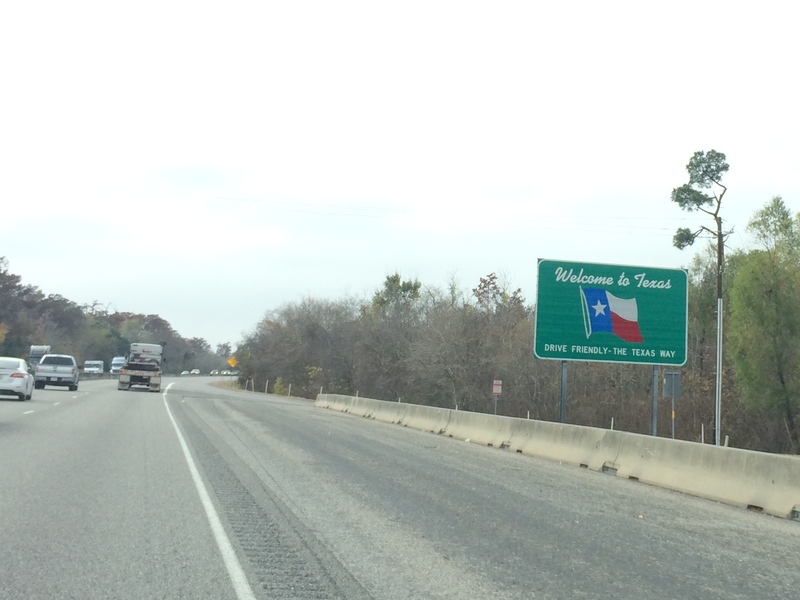 Because the state of Texas is presumably larger than most countries, we spent half our time in Texas driving across the state. Probably not, but it sure felt that way. 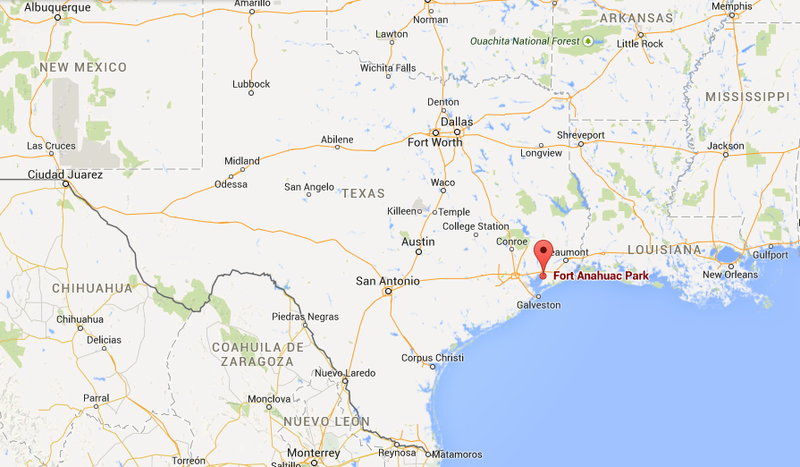 Driving from New Orleans to Austin was a long haul, so we broke up the journey by spending our first night in Texas at the historic Fort Anahuac, located at the edge of Trinity Bay. 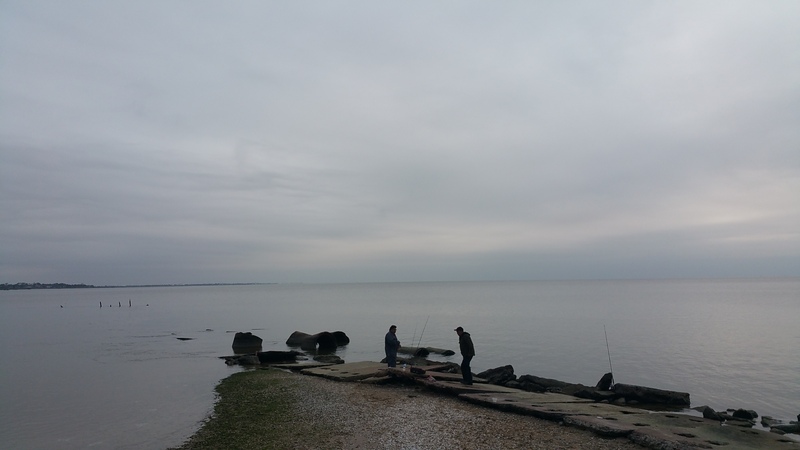 Campers can spend up to 3 nights there for free and are rewarded with pristine views of a natural ocean bay. 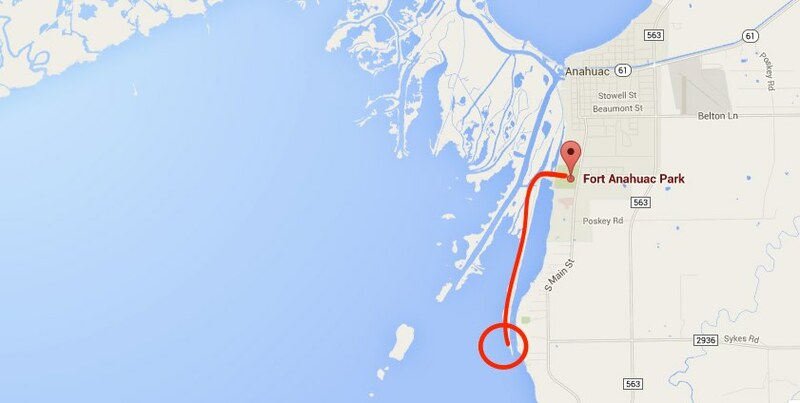 We went for a jog to the tip of this peninsula. 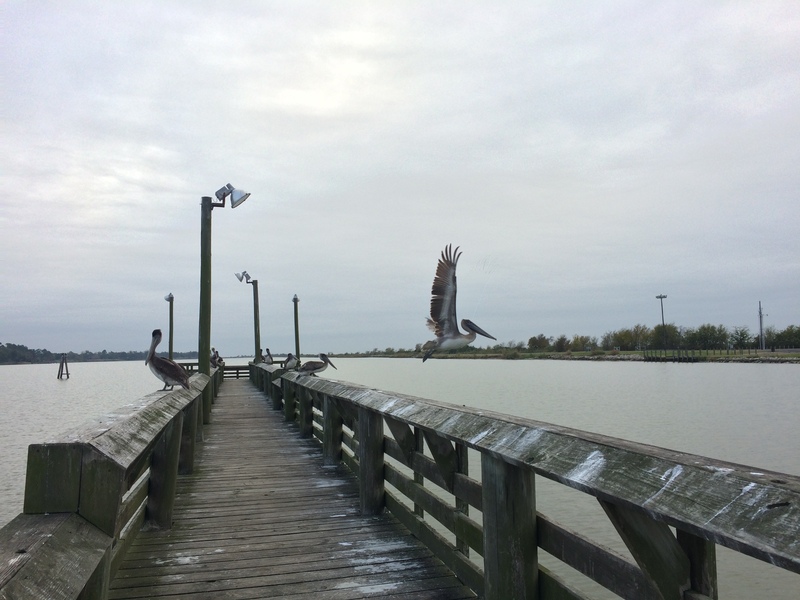 Piers from Fort Anahuac were also congested with large birds, mostly pelicans. Following the days after Fort Anahuac, we spent some time in Austin (after thankfully parking Scromp in Elgin). Before, I thought the portions of American entrees were huge. Texas takes it up a notch–portions are not just gargantuan in Austin, but seemingly so throughout Texas! 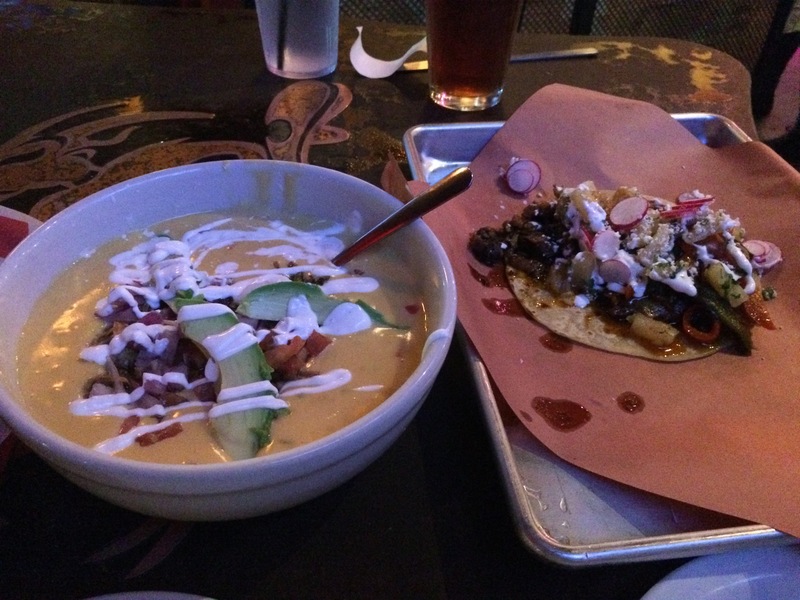 Below is one bowl of “super” chile con queso and one brisket taco. The queso literally filled a pho bowl. We visited 6th street. We chowed on brisket, Tex Mex, and burgers and shakes at Mighty Fine. We hung out at Mellow Johnny’s, Lance Armstrong’s bike shop. While my bike got worked on, I went for a run around Lady Bird Lake like a local. 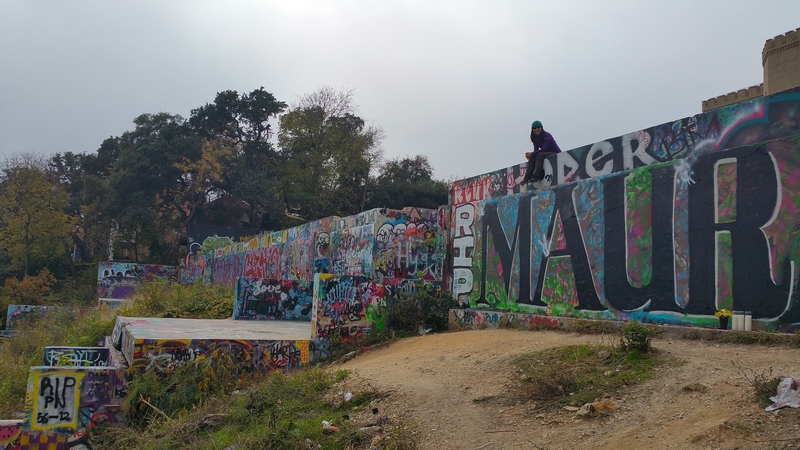 We even made a brief visit to The Austin Graffiti Park, one of the largest outdoor galleries in Texas. They say that Austin is weird for Texas. Personally, I didn’t think it was weird at all, but that’s because I’m not a Texan, nor have I explored much of Texas. I’ve even seen way more cowboys and pickup trucks in the smaller state of Wyoming. On a normal day without special events, Austin’s temperament is far from being the sleepy capital like Des Moines, but it’s also far from being the energetic, bustling city like San Francisco, Chicago, New York, or New Orleans. It’s a quaint place to visit like Portland, Seattle, and Denver, once all the other notorious cities have already been exhausted…definitely an awesome city to live in, but not a spectacular city for tourists. But hey, everyone is different, and I prefer rancor over relaxation. After Austin we spent a couple nights at Chris’ aunt’s house in San Antonio, Texas’s next “weird” city. We participated in a charity half century ride and were blown away by how flat the entire course was. After years of cycling in the bay area rolling hills and mountains, we enjoyed keeping a fast-ish pace despite the gnarly winds. 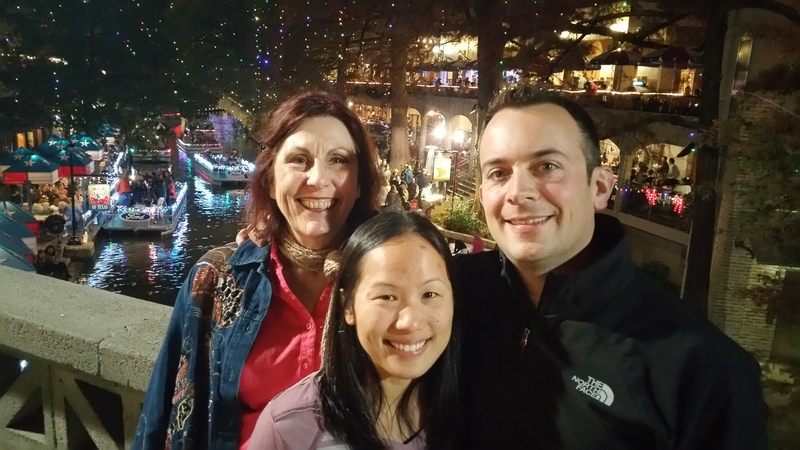 That evening we feasted our eyes and bellies over BBQ in San Antonio’s river walk. 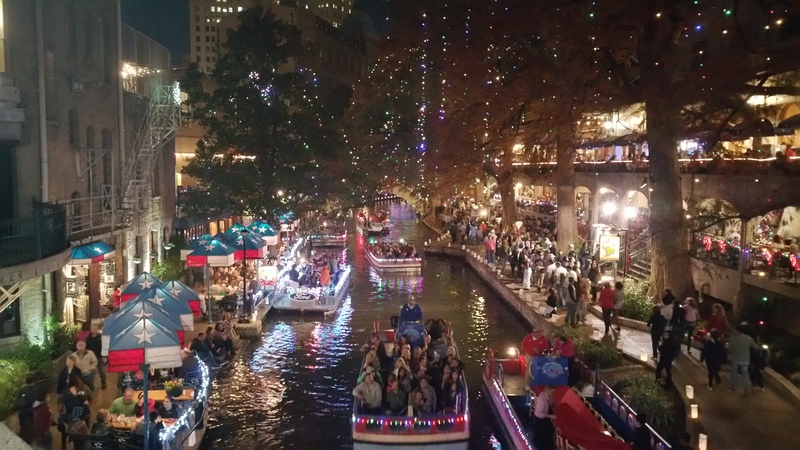 Already a delight to locals and tourists, the river walk enchanted us further with its magical holiday lights. Christmas lights dangled from trees, candles flickered along the riverside, and Christmas-themed boat taxis cruised placidly down the river filled with cheerful holiday carolers. Wait times for all river-lined restaurants exceeded an hour, and ice cream and chocolate shops overflowed with families and children. Our week at Fort Anahuac, Austin, and San Antonio was brief, and the portions of food and savory BBQ will leave a lasting impression in me. After spending the past 6 weeks in cities and suburbs in the Midwest, East, and the South, our hearts yearned to return to national park territory, and we ventured west toward New Mexico to satisfy our bug for America’s natural wonders.